Theresa May survived last night’s ballot on her party leadership by 200 votes to 117, with over a third of her MPs electing to end her reign. The result of the secret ballot was announced in a room filled with lobby journalists, plus a few MPs, on committee room corridor in parliament at exactly 9pm. As Sir Graham Brady (currently 1922 Committee chair, though that could be coming to an end) read out the voting figures, loyalists clapped and cheered, but their celebrations were short-sighted. The number of 117 was higher than expected, with most having predicted around 80-100, and indicates that the internal opposition against May goes beyond the core group of hard Brexiteers in her party. 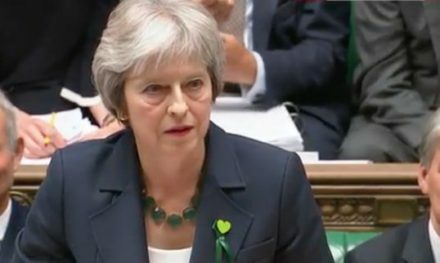 Although the Prime Minister is now safe under party rules from another such challenge until 12th December 2019, several promises she can’t keep were made to ensure her survival and the level of Tory infighting has been ramped up rather than quelled. Labour’s take on the no-confidence vote drama is that it doesn’t matter. That was clear in PMQs yesterday, when Jeremy Corbyn neglected to mention the ballot until the end of the session. ‘What is Corbyn doing?’ the commentariat tweeted. ‘Hasn’t he seen the news?’ But this was the right call: Corbyn knew May would probably survive, and it could have given her the chance to remind him of his own no-confidence vote by the PLP. Most importantly, the Labour leader is bang on to say the vote is “utterly irrelevant to the lives of people across our country”. Life expectancy is falling for the poorest, Universal Credit has not been radically changed as required, and the largest government departments are not fit for purpose. Crucially, the ruling party does not have a working majority to get legislation through parliament and May’s deal still cannot pass. Corbyn is calling on May to “bring her botched deal back to parliament next week”, but this seems unlikely. The stubborn PM is running down the Brexit clock and flirting with no-deal by doing so. The only question that matters is whether the DUP, or even Jacob Rees-Mogg’s ERG, are willing to pull the plug and help Labour bring down the government.